read about were here, vampires, shifters, witches etc. and a new one, hunters. Chase is a young hunter whose father works for the Circle, a group of upernatural types keeping the demon population under control on our world. mother away, accusing her of adultery. Rayna must find a way to stop him and not get themselves killed in the process. Rayna and Marcus can feel there is power inside Chase, but will it reveal itself in time to save them? This novel is nonstop action all the way, almost too much. I felt like I needed a place to catch my breath. 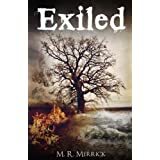 Most of the characters are all well rounded and three dimensional, the plot exciting, leaving the reader on the edge of their seat right up to the end. Vincent, the vampire, was perhaps the only one I questioned. His character changed, scary and intimidating at the start and then turning into a bit of a wimp by the end. I’m not sure I cared for this, but perhaps in the next novel it will be explained. I ran into several typos along the way, but they weren’t enough to take away from my pleasure while reading. Just a momentary blip and off we go. Personally, I can’t wait to read the next in line by M.R. Merrick. A real pleasure to read and review and deserving of its five star rating. Posted by Denna Holm on July 18, 2011 in Archives.